I have to admit: I almost didn’t finish reading Colin Wilson‘s 1969 novel The Philosopher’s Stone, recently reprinted by Valancourt Books. The novel is, in my opinion, a slow-starter; it takes quite some time for this curious story to find its focus. Once it does get started, though, Wilson’s curious mix of science fiction, history, philosophy and horror — written as an answer of sorts to the work of H.P. Lovecraft — is quite eerie and compelling. What is it about? Like most of Lovecraft’s stories, it centers on intellectuals who delve too deeply into forbidden history — and inevitably draw the unwelcome attention of nearly omnipotent and uncaring beings more ancient than the Earth itself. The book is written as the memoir of Howard Lester, a young and brilliant scientist who has been obsessed from a very young age with the problem of human longevity. It is possible, he believes, to extend human life, perhaps indefinitely. At first, this belief is merely intuition; as he grows older and more learned, however, Lester discovers that the secret is tied more to human consciousness than physiology. He and his colleague Sir Henry Littleway accidentally learn that a simple modification of the brain’s prefrontal cortex can lead to a higher state of consciousness and vastly improved intellectual capability. Undergoing the procedure themselves, the two men quickly learn that the modification leads to other powers that ordinary men would consider supernatural, including the ability to see visions of the past that are tied to objects and places, and to intuit the age of said objects and places. When the scientists come across a curiously-carved idol of unknown origin, they are shocked to find that it vastly predates the known civilizations of mankind; they are then disturbed to find that something is blocking their vision of the object’s history. When they press further, something pushes back. A powerful psychic force begins to apply pressure to their minds and to the mental processes of their friends and family. Lester and Littleway find themselves uncovering the secret history of not only humanity but also the monstrous beings that preceded it — beings that are willing to kill to remain hidden. 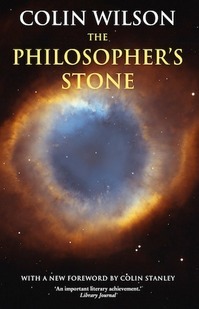 The Philosopher’s Stone is a curious novel, as it was written in response to a dare! In a 1961 survey book on literature and imagination titled The Strength to Dream, Colin Wilson blasted Lovecraft as “a bad writer” who had “rejected reality.” This irritated August Derleth, author and longtime champion of Lovecraft’s works, and Derleth challenged Wilson to write a better version of Lovecraftian-style horror. Wilson’s response was the 1967 novel The Mind Parasites, which Derleth very sportingly published under his own Arkham House imprint. He followed up this work with The Philosopher’s Stone, whose time travel concepts are similar to those in The Shadow Out of Time, the one Lovecraft story that Wilson admired. Does Wilson succeed in building a better Lovecraft? It kind of depends on how you interpret the challenge. In one sense, I would say that Wilson misses the point: Lovecraft’s work is intended to convey the insignificance of humanity in a vast and uncaring universe, whereas Wilson’s work suggests that humanity can fill an important role in reality, if we can only find the will. However, Wilson also provides a unique and often unsettling take on Lovecraftian mythos, and has his own storytelling agenda. The Philosopher’s Stone is unmistakably a mythos work: the usual suspects such as the Necronomicon, the Great Old Ones and Cthulhu all make appearances, though always in unusual and even refreshing ways. Wilson cleverly mixes weird and true events and items from ancient history to bolster his story, crafting an intricate and mysterious web of connections. This in itself is rather worth the effort of reading, and there were a number of points in the novel when I said “Aha!” upon reaching a surprising revelation. As noted at the beginning of this post, The Philosopher’s Stone takes a while to get going — in the 300-plus-page novel, it is literally 150 pages before the book becomes sinister. This is not surprising when you realize that the book is also partly a philosophical tract expressing Wilson’s views on life, consciousness and experience. The first 150 pages are a detailed discussion of theories of the mind, longevity, experience, and history; I found myself glossing over extended passages a number of times. When the plot does pick up, however, it becomes quite creepy and atmospheric and difficult to put down! The sinister psychic cat-and-mouse game between Lester, Littleway, and the unspeakable ancients is unique and very compelling. Would I recommend The Philosopher’s Stone? Yes, with the caveat that those looking for a simple pastiche of Lovecraft’s work, or those looking for a fast-paced horror story, will be disappointed. Those interested in a unique philosophical take on Lovecraft’s mythology will find Colin Wilson’s novel a challenging but rewarding read. This entry was posted in Horror, Lovecraft, Science fiction. Bookmark the permalink. In 1968 I read Wilson’s The Mind Parasites, a novel in which mental parasites are fought off with the use of phenomenology. It was, for a 15-year-old boy an exciting and thought-provoking book. it also informed the growth of my library as I collected books by philosophers mentioned in his book, including Husserl, Wittgenstein, Descartes and numerous others. As years went by I collected virtually all of Wilson’s books, many of which are truly excellent (I still hold Ritual in the Dark in high regard). In 2000 I had the opportunity to interview him when he came to Toronto for an author’s convention at Harbour Front. Like you, I found Philosopher’s Stone a strange mixture — even for Wilson. It is still, however, a fascinating read. Glad to run across someone else who at least knows of this author. Thanks for commenting! It’s worth noting that Valancourt Books has been reprinting quite a few of Wilson’s books, so hopefully his work will get some new appreciation. Nice review – Wilson has been mostly ignored over the years, except in Japan (where he is huge), in Russia and also in the Middle East at one time. A recent book from Graham Harman, one of the “Speculative Realism” group of philosophers, made the (ahem) original connection between HPL and Husserl. Needless to say, CW got there first, but they didn’t know that as they never mention him. I too interviewed Mr Wilson a few years ago, and he is a gentlemen as well as an extraordinary writer. Thanks for the comment! I’m looking forward to investigating more of Wilson’s work myself.